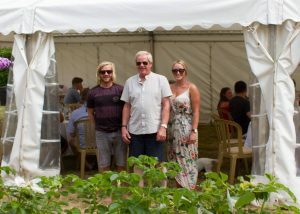 Vibert Marquees Ltd is a family run business, based in St Ouen; we want you to meet the team behind the name. Nigel is probably one of the nicest people you will ever meet, granted he will laugh at his own jokes however nothing is ever a problem and he will always go that extra mile; he will take you from the start to the finish for your event. Prior to becoming managing director he was in the farming and building industries, ask him anything and he’ll show you how it’s done! Nigel took over the company in 2008 and has been the face of Vibert Marquees ever since. James is not only our manager but our in house carpenter; prior to joining the family business he worked as a qualified joiner. He builds our bars, wooden double doors and he also designed and built the sheds where we store our equipment! Impressive to say the least and very handy to have on site! James became a full time member of the team in 2011 and has mastered the art of leading teams and fully understands the importance of communication. Georgina re-joined the family business in October 2016 after originally helping out in the office when Nigel first took over the company in 2008. If you have called or emailed us you will have dealt with her, only too willing to answer any questions you may have and with a keen eye for detail she is the person to speak to when it comes to planning an event. Before re-joining Georgina qualified and practises as an Integrative Nutritionist & Health Coach, she has definitely created a calming influence over the team! Georgina can be found working away and forever hoovering the office in the sheds in St Ouen. We hope you enjoyed getting to know us, we look forward to getting to know you. From all the team at Vibert Marquees Ltd, have a wonderful day!